Pierre Gaultier de Varennes, Sieur de la Verendrye (1685-1749), was a French military officer who succeeded his brother as commandant of the great fur-trading area north of Lake Superior. He was the first French trader to establish posts west of the height of land, and built a string of posts up the Saskatchewan River valley. 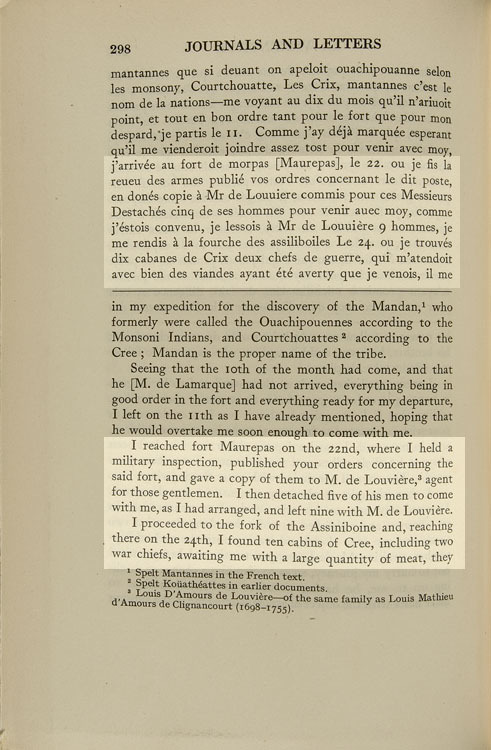 “I reached Fort Maurepas on the 22nd [September], where I held a military inspection, published your orders concerning the said fort, and gave a copy of them to M. de Louviere, agent for those gentlemen. I then detached five of his men to come with me, as I had arranged, and left nine with M. de Louviere. I proceeded to the fork of the Assiniboine and, reaching there on the 24th, I found ten cabins of Cree, including two war chiefs, awaiting me with a large quantity of meat, they having been notified of my coming. They begged me to stay with them for a while, so that they might have the pleasure of seeing and entertaining us. I agreed to do so, being glad of a chance of talking to them. I got the two chiefs to come to my tent. I knew that they went every year to the English post, and that one of them, according to a report made to me, had received a collar from the English together with a present as an inducement to do some bad turn to the French. I told the one who had been accused all that had been said to me about him. I had the honour to write you last year from Michilimackinac an account of the rumours that were current on this subject. He replied: ‘My Father, I know that there are a lot of envious people who talk against me. I have not been to the English for the last six years, but in recent years when the French abandoned us I did send there : we had to have our needs supplied. Ask those who went there for me, and who are here now, if they ever heard anything like that spoken of. Read more about the Verendryes - enter 'Verendrye' in the search box to your left. Check the Beaver Index - type 'Verendrye' in the keyword box. La Verendrye replied that he was determined to go and that he would teach the Assiniboine how to hunt beaver.